This garden lies to the south of Shinden, hence the name “South Garden” (南庭 nantei). 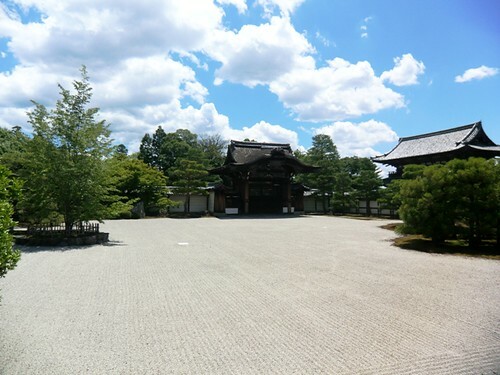 It is now referred to as “nantei” in Japanese, but the official pronunciation is actually “dantei.” The fine gravel in the garden is similar in brightness to snow on a sunny day. Before electric lights, gardens with white gravel helped illuminate the space at night by reflecting moonlight. 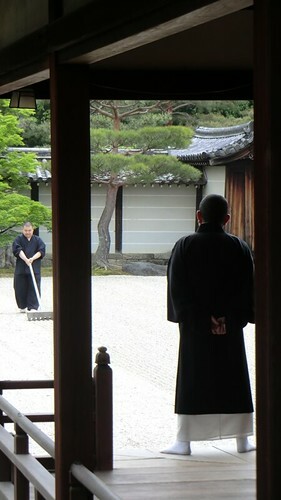 The lines in the gravel are meant to evoke the image of water and are regularly redrawn by the monks with a special rake. The elegant simplicity of the South Garden is due in part to the purpose this garden was made to serve. The South Garden was built as an entryway into Goten. Chokushi Gate (centered in the photograph above) was the gate through which the emperor entered, and on such occasions the South Garden would become his walkway into the palace. 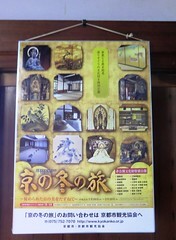 While the emperor does not visit the temple much any more, there is a festival in October for which the Chokushi Gate is opened annually. During this festival the South Garden is able to fulfill its more practical purpose, during most other times the garden has taken on a purely decorative function.